2013 ( US ) · English · Documental, Drama, Historic · G · 85 minutes of full movie HD video (uncut). 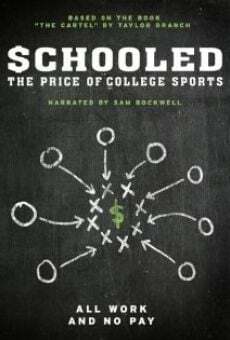 You can watch Schooled: The Price of College Sports, full movie on FULLTV - Film with fantastic direction of Ross Finkel, Trevor Martin and Jonathan Paley. This movie was presented in 2013, with original production from USA. You are able to watch Schooled: The Price of College Sports online, download or rent it as well on video-on-demand services (Netflix Movie List, HBO Now Stream, Amazon Prime), pay-TV or movie theaters with original audio in English. This film has been premiered in theaters in 2013 (Movies 2013). The official release in theaters may differ from the year of production. Film directed by Ross Finkel, Trevor Martin and Jonathan Paley. Produced by Daniel Novack, Douglas Lorentz, Domonique Foxworth, Terry Maltese, Mitch Slater, Bobby Valentine, Karen Duffy, Anthony Maltese, Ravi Singh, Robert Musumeci, Andrew J. Muscato, Matt Brynes, Taylor Branch and Robert Castrignano. Soundtrack composed by Tyler Strickland. Commercially distributed this film: Strand Releasing and Epix. Film produced and / or financed by Makuhari Media. As usual, the director filmed the scenes of this film in HD video (High Definition or 4K) with Dolby Digital audio. Without commercial breaks, the full movie Schooled: The Price of College Sports has a duration of 85 minutes. Possibly, its official trailer stream is on the Internet. You can watch this full movie free with English subtitles on movie TV channels, renting the DVD or with VoD services (Video On Demand player, Hulu) and PPV (Pay Per View, Movie List on Netflix, Amazon Video). Full Movies / Online Movies / Schooled: The Price of College Sports - To enjoy online movies you need a TV with Internet or LED / LCD TVs with DVD or BluRay Player. The full movies are not available for free streaming.